Very good piece in the Irish Digital Golfer Magazine of what seems a sorry mess that will see no amateur in the Irish Open field for the first time since 1927. While Rory McIlroy gave an explanation that it's now a Rolex Series big field event and has only big name players blah blah blah the real reason seems to be that Golfing Union Of Ireland (GUI) were offered six spots and......wait for it......turned them down. Shane Lowry launched his career as an amateur winning the Irish Open. However it is understood that it was not a European Tour decision but the Golfing Union of Ireland that declined to afford invitations to Ireland’s leading half a dozen amateurs. This is because the six in question are set to contest the European Amateur Team Championships a week later in Austria. So, it was GUI’s CEO Pat Finn who confirmed it was mutually agreed with the Tour not to take up invitations this year due to the date clash. Surely there are more than six worthy amateurs in the whole country of Ireland that could take up those spots? 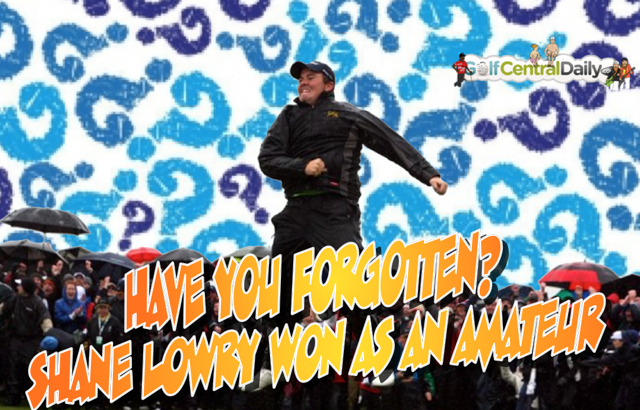 Are we forgetting that Shane Lowry won the Irish Open as an amateur? Somebody please explain this to me?